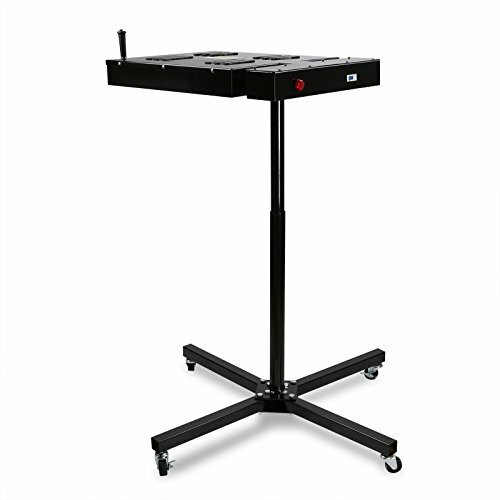 This is a professionally flash dryer 16"x16",1700w .Adjustable stand from 30" to 48" ,base with wheels to move wherever you need. It is only about 2/3 the weight ,much lighter ,but has a big diameter (over 50") to prevent it from tipping over.It can easily cure plastisol ink for silk screen printing. Adjustable stand from 30" to 48"
Heating Area: 16" x 16"
Base Dimensions: 38" x 38"
Top Dimensions: 29" x 19"
This flash dryer can be raised or lowered from 30" to 48"